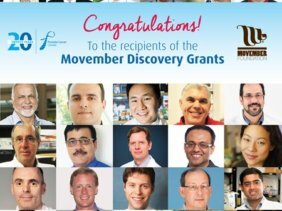 This is our second Movember Pilot/Discovery Grant (I’m in the middle)! The goal of this grant is to develop microparticle-based blood tests that use biomarkers specific for Gleason 6 (3+3) vs. Gleason 8 (4+4). This way, we’ll be able to monitor patients on active surveillance (patients who have deferred radical therapy) and when their cancer progresses to Gleason 4+3 or 3+4 or even higher, then we can recommend a biopsy which will determine if the patient requires surgery/radiation therapy or not. This is a more accurate way of determining when a patient needs biopsy. Freedom from needles right? No such luck, but maybe these patients will see less needles (12 needle core biopsy vs. single venipuncture). ← Congrats Dr. Karla Williams!